The outer ear consists of the pinna, the ear canal and the eardrum. The pinna collects sound waves in the air and channels them into the ear canal. The size and shape of the outer ear naturally amplifies speech sounds and allows you to localize the direction of a sound above, below, in front or behind you. The two bends in the ear canal help to protect the fragile eardrum, which is the boundary between the outer and middle ear. When sound waves hit the ear drum they cause this to vibrate. The middle ear consists of an air filled cavity containing a chain of three tiny bones. These bones are called the Malleus (hammer), incus (anvil) and stapes (stirrup). The stapes bone is the smallest bone in the body, half the size of a grain of rice!They transmit sound vibrations from the eardrum to the inner ear, connecting with the inner ear at the oval window. A small passage called the eustachian tube connects the air-filled middle ear cavity with the back of the throat. 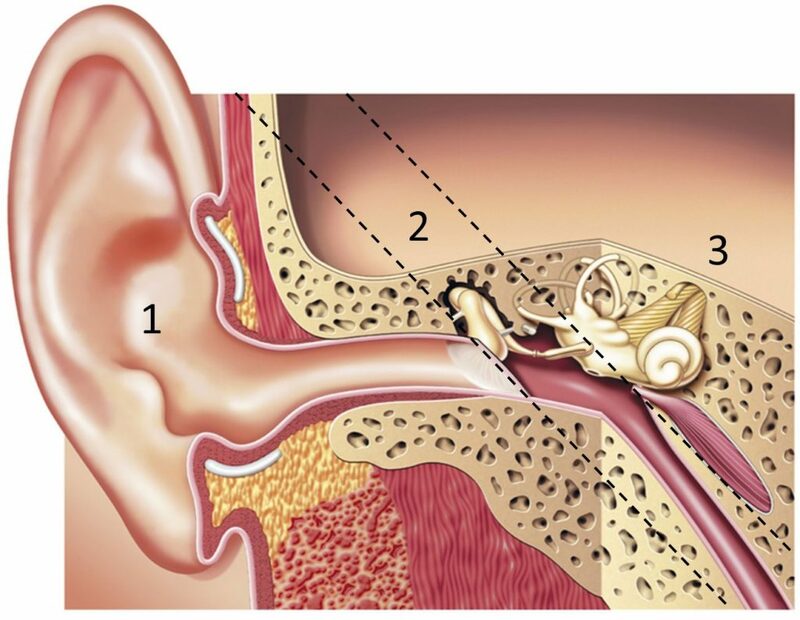 The function of the eustachian tube is to equalise the air pressure in the middle ear to the outside of the ear, keeping the eardrum in a state of equilibrium which promotes maximum sound transmission. The inner ear consists of the cochlea, a shell-shaped bony spiral filled with specific fluids and lined with tiny hair cells that connect to nerve endings. These nerve endings connect to the hearing (auditory) nerve that transmits sound messages to the brain. The organ of balance is also connected to the inner ear. Sound waves travel along the ear canal and cause the eardrum to vibrate, in the same way as a normal drum. The movement of the eardrum causes the tiny bones in the middle ear to vibrate, and these vibrate the oval window. This enables sound to be transmitted to the cochlea in the inner ear, which in turn sets the cochlea fluid in motion. The tiny hair cells in the cochlea respond to these vibrations by creating electrical signals. These are carried along the hearing nerve to the brain, where they are processed and interpreted as sound. The specific configuration of which hair cells send signals allow us to determine what type of sound we have heard.